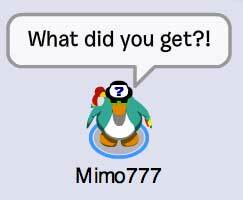 Club Penguin Cheats by Mimo777 Club Penguin Cheats by Mimo777: Merry Christmas! What Did you get!? For Christmas I got a brand new laptop that's super fast, it's awsome! Well that's all, wait, I also got a fuzzy robe! Well see ya! I got a bee pillow pet, a new game, a shirt, pants, a c d of some band, and a other game, and the best Christmas ever! A CD and two books! Red Wii, Club penguin game day, New Super Mario bros, clothes, card jistu water cards, club penguin dragon plush, and a penguin pillow pet. For Christmas I got a Snuggie, a laptop, 2 books, a scarf, candy, lotion, bubble bath, and perume!!!!! thats it! your #01 fan! Merry Christmas to you and your family Mimo! :) He he you got underwear for Christmas. That's funny. lol I really didn't get anything, just basically money. a lot of cp stuff socks underwear, ipod touch(my first) and my grandma gave me a 100 bucks!! hi mimo! i got: a wii,wii fit plus,wii drawing pad,club penguin air hockey,nail glitter and gem by conair,club penguin cards,criss angel magic set,club penguin game day,and a crayola glow pad for my door! i think thats about it. my parents forgot about stockings. D:that stinks.rock on mimo! i got lots of cp stuff and mario wii games! I got an iPad,some cool city building blocks, art supplies, a coca cola polar bear plush, an erector set, a Hess truck, and some Axe!!! I'm writing this on my iPad!!!! Hope u have a great christmas mimo and try to stay phunnie! I got a laptop which im using right now a ihome for ipod 4g but ive had the ipod for about a month or so anyways i also got itunes clothes and some other little stuff best christmas ever!!!! 7. I GOT LIKE 137 GIFTS FOR CHRISTMAS! I got an I pod touch to I'm using It right now to type this meet christmas! mimo what would a puffle look like without its fur? merry christmas mimo and the gang! i got a play station 3 and a snow ball maker it is awesome! I got a iPod touch too! woot woot! I'm still celebrating write now! Still opening gifts with my family! I love Xmas! For Christmas I got Uggs, a necklace with some charms, 2 braclets (1 is a peace sign and the other is a heart) the new Taylor Swift CD, some cloths (jeans, shirts, cardigin) socks, socks, socks, candy, and Just Dance 2. That's it only other things were gift cards! Merry Christmas! A really merry christmas for ALL you awesome penguins here from Finland! I opened my gifts already yesterday, on X-Mas Eve. I got LOADS of cool stuff (thank you mommy). Two hoodies, two bags, money, sockes & otha clothes, charms 4 my bracelet, Wii-games, three books, CANDY :D and a red Nintendo DS lite!!! Luv ur site Mimo777, best blog evah! Hey mimo! Did you know that when you go inside the lighthouse, click the "snowball" button and throw it anywhere in the lighthouse and Presto! It turns into a coin! I meant ring, not right!!! I got an electric keyboard a timeturner keychain a couple of wii things shirts guitar stand guitar for dummies an pjs :D best Christmas Eva!! MERRY CHRISTMAS MIMO AND GANG! I am a Beatles fan thats why and i am going to buy a laptop for me at boxing day. You rock mimo cool gifts you had. finger trap and finger chopper! home alone dvds all of them! and a small accesoaries bag. 14: 9 club penguin mini figures in 1 box with 2 coin codes!! hi mimo777 and everybody else. for chirstmas i got:a monkey pillow pet,connect four,barbie dolls,trouble,halo reach,a gum ball machine,just dance2,disney sing it,1clubpenguin penguin plush, clubpenguin card jistu cards spongebob walkie talkie watches,and more dolls. Hi Mimo :) , merry christmas and happy new year !!! For a Christmas i got : Aprilia sr 50 ( scooter ) !!! I dont celebrate christmas but ill tell you what i got for hannukah! Three lego Hero factory sets. Hew Mimo Merry Christmas you are the best Gang Club Penguin Cheat ever ! 12 month Club Penguin Membership 35 £ ! 12 month Moshi Monsters Membership ! 30 £ ! This is all my stuff from my HUGE family!!!!! -and a giant chololate $1,000,000 bill. 1. a new gear bike!! 3. a cjw tin with 6 packs in it!! I have more but there is a lot!! and on Xmas eve my grandmother gave me a pillow pet!! this is my best CHRISTMAS EVER!!!!!!! -A ton of Aeropostale clothes! -The Sensei collection tin of 4 packs of Card Jitsu cards! -40 bucks in iTunes gift cards! - DJ Hero : Bundle pack with 2 turntables, 1 microphone and the 2 DJ Hero games for Wii. - A Wiimote and a Nunchuk. - A French comic book "Le Petit Spirou". I got and iPad!!! I'm actually using it now (typing this lol) And i got some new albums on iTunes, i got two club penguin books, and some bits.....rofl. I couldn't sleep last night at ALL. Reason? I bet you know how hard it is to sleep when you know Christmas is the next morning. Well I got a , a flat screen, new clothes, Clubpengui Water Jitsu Cards, Clubpenguin Game Day, Kirby's Epic Yarn, Raw vs. Smackdown 2011, Clubpenguin: Herberts revenge, and a bunch of other new games. Plus, today, our family is having a Christmas party at my grandma's house. That means more presents!!! I got some display gear to put my Taekwondo belts on (2 of them), some ear buds, some clothes, $90, and an iPod Touch. I will use the $90 to buy some stuff. These are the club penguin things i got! Got cp cards and a membership! MPS AND CHRIS ANGEL MAGIC KIT. plus wii games. 1. I ALSO got underwear and iPod touch. LOL. From Santa. 3. I got some Card Jitsu Water cards from Santa! My favorite one is the orange puffle card. 4. I got Diary of a Wimpy Kid 5 from Santa. 5. A joke book from other aunt. 6. Limited Edition "Super Mario All Stars" for Wii from other aunt. 7. Pajamas from my grandpa. LOL. I got a new iPod, clothes, a bunch of things to entertain me xD, and yes, of course, underwear. i diddnt make a list but i got a mini labtop (on it right now :D) mario allstars kirbys epic yarn mlb power prows 08 some clothes and sweat shirts i got an ill shirt thats for phillies. i got a baseball bat and batting gloves and some shoes thats it happy hollidays everyone! i have 2 open my presents @ night this year (...) cuz of my parents r separated, so i have 2 wait. i really want CP stuff! i barely have any. lego, AND my main prezzie is..
Um, I got lots of stuff, but I also got a White puffle, a yellow keyring puffle and the dj cadence figurine set! A club penguin card collector tin that came with four packets of cards. Some scented candles and some insesnce to burn. P.S A parrotlet is a bird it is the worlds smallest species of parrots! i got not much, lol i didnt want much. and tea (monkey came with it, pg tips moneky ) and i got a thing that i can sleep in :D.
i love 2012 & CP game day!!! I got series 3 mix and match for cp. And this has nothing to do with christmas but i have 712 Card jitsu cards. Mimo777 you have the best Cheat blog I ever went on To you rock ! I always Obey the rules of Club Penguin and you Rules to ! 2. Club Penguin 12 month Membership ! 3. Moshi Monsters 12 month Membership ! So that's what I got I think you the best Mimo I play On Club Penguin everyday now my penguin is 1260 days old ! I like about Christmas is you can donate coins in you igloo to help people and how you decorate willl Twistmas stuff like snow man ! i didnt get as much as my lil bro and sis but thats because i got a kindel. I got a nintendo dsi and my dads getting me the cp games for it. I got a orange puffle pillow and a key chain green puffle! And when i unlocked the green puffle i unlocked the hidden page and got to unlock an EXTRA 2 ITEMS! Best CP Christmas EVER! I can't really be bothered to say the rest because i haven't opened them yet! See ya! I got 2 books, a mosaic kit, a bag, club penguin cardjitsu cards, a toy puffle and a soldering iron. I also got clothes a book voucher and $50. A Money Box, A 4GB USB, A Progection Alarm Clock, Buzz Lightyear LEGO, A Colouring Book, Doctor Who Quiz Book, Doctor Who Wii Remote, Magic Books + Magic Tricks, A Deck of Cards, Doctor Who Badges, Aspergers Syndrome Badges (I've been finding it hard to take it in), A Skeleton for my Yr 7 Locker next year, and AWESOME shirts. Hi Mimo! I got a toy of Bowser from mario, a Mario shirt,and a cell phone! I got that new book by Rick Riordan, a Geo-gami set, a Wii points card, a Simpsons laugh-a-day calendar, a new bike cuz my old one broke, dvds of Toy Story 3, Despicable me, and Alice in Wonderland (the new one), candy, underwear, a $20 giftcard to Gamestop, $87.50 cash, an iTunes giftcard ($15), and last but not least, a couple more items that I don't know. Merry Christmas! 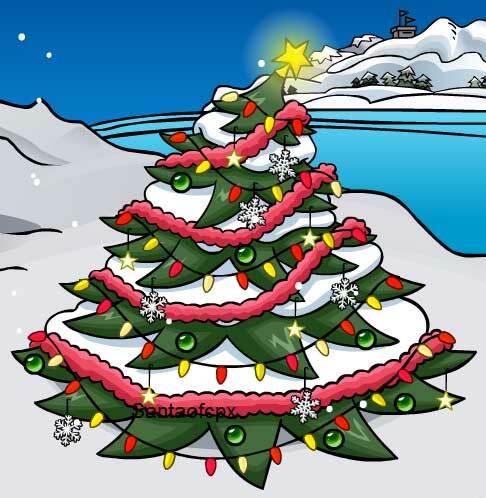 I wish on CP they let non-members buy items on Christmas, but then when its limited again they can still wear them. They should totally do that, I prefer not to waste $6 a month just to wear clothes online. You haven't posted this so i'm just gonna inform you about it. CP fixed the wing warmers glitch. they show up on your penguin now! :D Merry christmas! i got chocolates and a shell necklace, and an ipad and soon im gonna get a laptop. I got a new itouch with a camera in it, a night vision scope, minute to win it & amazing race wii games, wisconsin badgers goalie mask(mini), loopz, nerf gun & dart belt thing, legos, pillow pet, and candy!!! I'm gonna get more from my relatives too! Don't you think Club Penguin should make a snuggie? I just got a Snuggie but it would be so much cooler if Club Penguin was on it...like a map of the world or a bunch of dressed up penguins! Anyways, I got some American girl stuff, (bloom bed & bedding, Lanie's pajamas and orangutan for my doll Lanie) Just Dance 2, Wii Party, Liberty Jane Shoes (for American Girl Dolls) and a DVD of Night at the museum. I had a lot of trouble sleeping last night, I was just so excited! I got up at around 6:40 and was so happy with everything I got! 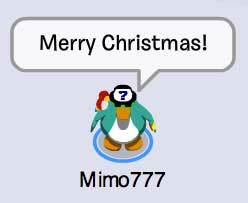 Have a wonderful Christmas Mimo777 and the clubpenguinggang! A hat, book light, 2011 glasses, and tons of useless stuff in stocking. MERRY CHRISTMAS EVERYONE AT CPG! A Link stuffy, a pillow pet, a badge, a new iPod nano, candy, a lot of videogames, a bit of clothing, an ocarina holster, a wooden sword, a wooden bow, weird arrows, a bit of money, a tech deck, some ornaments, a computer screen cleaner, an iTunes gift card, and some more stuff. Hey Mimo, I got a cool HD cammara for christmas and like $200 in money!! CHRISTMAS SHOPING!!!! A MacBook Pro, and Call of Duty: Black Ops, oh and some gold! No I'm not meaning money, It's real gold!!!!! Merry Christmas Mimo and everyone else! I don't want to say it all. I'll just say the highlights: An Xbox 360 and KINECT! LEGO Universe, LEGO Creationary, club penguin Card Jitsu Cards, UNDERWARE! TWILIGHT FAN WOOOOO!!!! U R AWESOME!!! A tray to put glass cups of drinks, and when you do, the glass will light up! Really cool. A stapler that doesn't need staplers. A dog piggy bank that will '' eat '' a coin if you throw it into its dish. Awesome! @supermanzz25 Its good for you don't celebrate it, atleast you have something instead of nothing. Wellp, I got a waterproof camera (ITS AWESOME)ummmm I got.... Oh ! I got moneh, a gift card, clothes, shoes, andddd Club Penguin Game Day! Wii game ( I WANTED IT SOOOO BADLY). I got a bunch of awesome stuff! The first one I opened was a PSP! Then after that, I got Kingdom Hearts: Birth by sleep For PSP. Then i got a Samurai book (lolz) and a Club Penguin Official Guide Extended version. Then i got a Laminator. And then A new backpack and a new wallet! A bunch of chocolate and sweets! Yum! But the soap was weird and warped. And a Bonsai tree growing thingy. REAL Astronaut food- Ice Cream! -lots of bubblegum cuz i just got my braces off! Oh an a penguin pez! and i bought myself a magic growing christmas tree!! and i got nail polish! that's it ;D Merry christmas club penguin gang! And a happy new year! I got an i touch, hair kit, itunes gift card, 50 bucks,candy, clothes, small goodes, lables, and bookes, wii, 2 wii games, an extra wii remote and numtuck,and drawing kit. MIMO!! Or.. A Medorator chosed by mimo in a weird way and this is getting really stupid now..Ok i discovered a New Update from CP.. Now the Holiday Presents can be more..Ehh the Blue one with the green bow and you can even lift it! Not like the ticket booth anymore! I found a cool cheat that I dont know if youve seen yet! Please post this on your page!!! Ok so go to the Town and you will see another arrow that takes you to a HUGE lit up Tree!!! Is it from the book from a while ago? Like the gazebo thigy??? hope u like this!! wow, the whole list, thats gonna take a while :P i got.... chocolate (duh,) clothes, (i chose cause i dont trust mum :P,) as a shared present me and my brother and sister got a brand new massive tv, cp game day and cp herberts revenge (!!!!!) ummmm, (yer i gotta umm lol) a beanbag! !, itunes card, alot. cant remebe the rest :D.
I got a MacBook Pro!!! I get a club penguin card jitsu rare colector box.A t-shirt hot weels aniversary edition.A bag of M&M candys. i got a new keyboard and mouse with no cable, a board game some clothes and today we celebrete by my grandmom, soo i we celebrate 2 time that mean 2 tmes a lot of presents. i think today i will get a new psp. well i know not only a selected numba of ppl celebrate christmas. Me being an indian, not christian i take EVERYTHING AS ONE. So I still didnt get anything but i was happy for everyone enjoying. Although i wasnt. i got a new red dsi and 1000 dsi points MERRY CHRISTMAS! and this awesome plastic nerf dart blaster called a vulcan, its awesome! Wow! 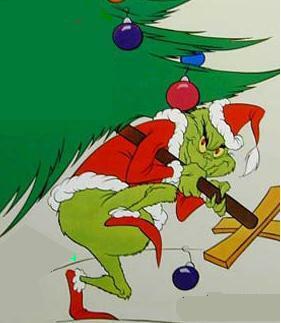 Nice picture of the Grinch. That movie was on TV the other day. It's Boxing Day right now in Australia. Merry Christmas! and more to come from the rest of my family! Oh and I am NOT an ONLY child!